The new year is just starting, and we know that the simple idea of cleaning your closet and taking out everything you don´t use already sounds exhausting and exasperating. You might even panic thinking about reaching certain areas of your closet, but we are here to tell you that you can make it fun. It´s time for you to sort your wardrobe and start the year off right. The first thing you have to do is to organise yourself and check each piece of clothing you have there. Make piles of clothes, sorting them out by type: dresses, blouses, skirts, sweaters, and so on. From each of the piles identify the pieces that make you look great and study them: what are the colours you used the most? Why? How did they make you feel better? That will show you what you should keep and prioritise. Choose the garments that match the two or three colours that resulted from your questionnaire and remove them from your piles. If you get something that is horrible and you will never use it again, just leave it behind! If you see that you have a lot of pieces of the same type, or clothes that look too much alike, just be brutal! Choose the one or two you like the most and forget the rest. Remember, you should only keep clothes you truly love, and will do so for a long time. We’ve all had that one dress we keep in our closets that we wear when we want to feel like a shining diamond. After choosing the garments by colour, organise them in the same way you sorted them out in the first step. Now your piles will be sorted by colours. 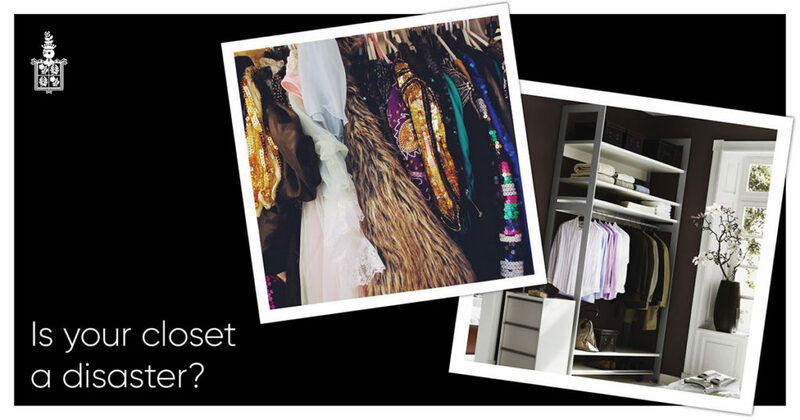 Seeing your wardrobe arranged this way will make it easier for you to create new outfits in the future. All you have left to do is folding and putting away the clothes you are keeping, and the pieces that have no remedy you can pack in boxes or bags, identifying if you are going to donate it or throw it in the trash. A pegboard for small things. Clear plastic boxes for scarves or underwear. Hooks to make room for bags and purses. Sloping platforms to make your shoes visible. Canvas drawers, to keep your sweaters. Finally, buy something nice and pretty to add to your renovated and organised wardrobe so that you can start the year fresh. A cute cocktail dress is something you should always have in your closet in case an event where you have to dress up suddenly appears in your calendar, or just to wear when you are feeling like you can take on the world. Remember that what you wear reflects how you feel on the inside, but sometimes it can work the other way around and clothes can have a certain effect on how you feel. This is why it is so important to only keep clothes that truly make you feel fantastic. So go on and treat yourself! Rosenwerth is the perfect place to find that clothing item you’ll love forever, with high-quality and gorgeously designer pieces that are timeless. You can look at some amazing dresses here and go to Gaby Rosenwerth’s studio to get that final addition that will make your updated wardrobe truly impeccable.